January is always a busy month around Shoeboxed HQ. The beginning of each new year brings lots of New Year’s resolutions on getting organized, the launch of some great new features and… the dreaded countdown to April 14th. Years change, but unfortunately tax day never does. Since tax season is important to all of you, it’s important to us, and this year we wanted to be as proactive as possible in helping you get prepared. After all, who doesn’t enjoy reducing their tax burden? 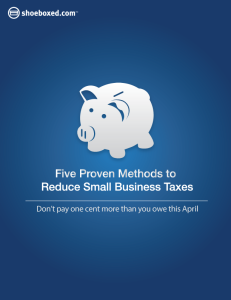 With that in mind, we’re pleased to release our brand new white paper: Five Proven Methods to Reduce Small Business Taxes. Download our free white paper today and prepare to save on your small business taxes this April!